Tonight sees the first night of Reading 2017, headed up by Kasabian. Heavily anticipated by all attending the festival (and those watching from the comfort of their homes). Highlighted throughout the years by Q and NME, the band are notorious for their enormous live shows, and thousands flocked the Main Stage to cheer and sing along to old and new favourites. 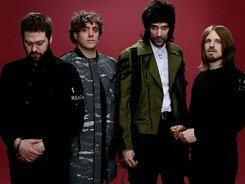 The band have recently released their 6th studio album ‘For Crying Out Loud’, and even those that aren't Kasabian fans will have heard their single ‘In Love With A Psycho’, performed with resounding success before striking into a moshpit-frenzied ‘Club Foot’. Frontman Tom Meighan looks and sounds like someone you’d meet down your local to sell you knock off trainers out of the boot of his van. But alongside guitarist and vocalist Sergio ‘Serge’ Pizzorno (potentially Noel Fielding’s doppelganger), bassist Chris Edwards and drummer Ian Matthews, the band form a powerhouse of English Rock that saw a sea of fans congregating before the stage and singing their set long into the night. There were no surprises with this set; you know exactly what you’re getting when you play a Kasabian album, and you know exactly what to expect when they play that album live. But play it well, with energy that has one stranger grabbing another next to them in a ‘lads lads lads’ hug they surely do, and no one was disappointed with tonight’s show. Tom Meighan bantered the stage, cheering the mere fact that 'I'm alive! ', to which fans cheered back their hearty appreciation. Sitting or standing, fans or not, no one was able to resist happily chanting their way through every chorus. Crowd favourites inclluded Underdog and grand finale Bless This Acid House and, voices hoarse, fans sang and drank their way to the end of the set, enjoying Kasabian for exactly what they are; a solid band with great tunes you can sing along to at the end of a drunken night out.